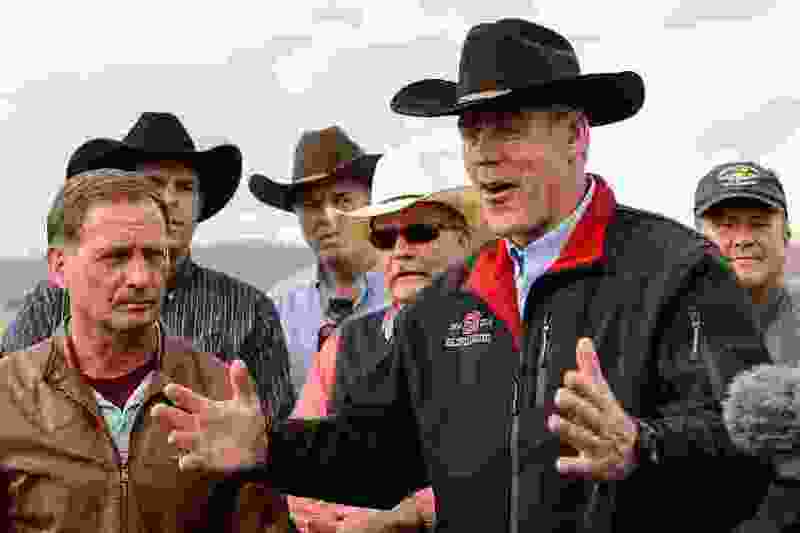 (Trent Nelson | Tribune file photo) Secretary of the Interior Ryan Zinke speaks at a news conference at the Kanab Airport in Utah, Wednesday, May 10, 2017. Standing with him were Rep. Chris Stewart and a group of county commissioners. A Utah judge has rejected a lawsuit by the environmental group Southern Utah Wilderness Alliance, accusing San Juan County commissioners of violating state open-meetings laws by meeting with Zinke in private last year. A state judge has summarily shot down the first of three lawsuits filed by the environmental group Southern Utah Wilderness Alliance alleging county commissions violated open meeting requirements when they met privately with Interior Secretary Ryan Zinke and other federal officials last year. In court filings, San Juan County argued that its commissioners’ conversations with Zinke on shrinking or rescinding Bears Ears and Grand Staircase-Escalante national monuments were not covered under the Utah Open and Public Meetings Act since counties have no say over national monument designations or adjustments, a power held only by Congress or the president of the United States. That argument swayed 7th District Judge Lyle Anderson, who dismissed the SUWA suit Friday without fielding oral presentations. “The County Commission was advocating on behalf of the county or its citizens when meeting with members of Congress or Interior officials,” Anderson, based in Monticello, wrote in his April 6 order, which also accuses SUWA of using the lawsuit to harass San Juan officials. SUWA has filed similar actions against Kane and Garfield counties, and the disputes could have broad implications for three-member commissions, a form of government used to run 23 of Utah’s 29 counties. Most rural Utah county commissions favor multiple uses of public lands — and lean toward oil, gas and mining industries over conservation restrictions, particularly when it comes to monument and wilderness designations that SUWA endorses. Victories for SUWA could require county commissions to notify the public of meetings and accommodate residents who hope to attend when two or more commissioners meet with federal land officials. “The issue is bigger than the monument. It strikes at their ability to function,” said attorney Mark Ward, who filed amicus briefs on behalf of a dozen rural counties. County commissions in Utah, Ward noted, play a dual role as lawmaking and executive bodies. SUWA officials say they intend to appeal Anderson’s ruling and rejected his rebuke, which was made with no prompting from San Juan County’s lawyers. According to SUWA legal director Steve Bloch, Utah’s meeting law is rooted in the idea that state and local officials must conduct business in the light of day. The San Juan suit targets commissioners’ taxpayer-funded trips last year to Washington, where they asked Zinke face to face to erase the Bears Ears monument, as well as visits with Utah’s members of Congress and other Interior officials last May and June. Then-President Barack Obama had designated the monument a few months earlier, and President Donald Trump later scaled it way back under Zinke’s recommendation. But Anderson’s ruling asked whether SUWA’s action was filed for “the improper purpose of intimidating” the county commission. The judge ordered the group to submit a brief by May 1 explaining why its suit does not violate laws against abusive litigation. The order raises the specter of judicial sanctions against a group that Anderson once criticized as a legislative candidate before he was a judge. SUWA’s related suits against Kane and Garfield counties, home to Grand Staircase-Escalante, were combined before 6th District Judge Marvin Bagley, based in Panguitch, who is expected to rule soon on nearly identical motions to dismiss. Ward argued at a March 22 hearing in support of Kane and Garfield. In an interview Tuesday, he said Utah law supports county commissioners’ common practice of meeting in private with Bureau of Land Management officials to press for land-use policies previously set in public meetings. Asserting that environmentalists’ true aim is “destroy rural communities,” San Juan officials hailed Anderson’s ruling as a victory for county authority. “SUWA has abused their platform and donors for too long. They have made money on the backs of the taxpayers by filing frivolous lawsuits and exploiting the Equal Access to Justice Act,” said Commission Chairman Bruce Adams, referring to a law that allows nonprofit groups to recoup litigation costs when they sue the federal government. That law, however, does not apply in SUWA’s meeting lawsuits and the group is not seeking fees in them. Bloch acknowledged the group does sue the BLM as part of its mission to limit motorized access and energy development on Utah’s public lands with wilderness characteristics, but those suits, he said, are grounded in law and supported by facts.